On demonstration for the first time at the Bristol Sound and Vision show February 20-22, and on sale from April 2009, the NaimUniti – the more music box – will deliver the customary Naim sound quality and emotional connection to music to a new generation of customers as well as existing ones. Naim developed the NaimUniti in recognition of a growing demand for integrated solutions. Sophisticated consumers are becoming used to converging audio sources but can be reluctant to compromise on quality. Now they don’t have to. The NaimUniti is the first all-in-one audio player to offer so many sources: CD, FM/DAB, Internet Radio, MP3/iPod, Digital Audio Music Streams and USB: making it the most music box. NaimUniti‘s Internet Radio player takes Internet Radio (iRadio) seriously, it’s not the afterthought that internet radio so often appears to be. It offers the listener a wealth of musical options, thousands of stations – narrowcasting at its finest – now easily accessible from a Hi-Fi component and available in Naim-quality sound. Also key is NaimUniti‘s digital audio music streaming capabilities. NaimUniti can wirelessly stream music stored on UPnPTM networked devices, providing access to even more music. With its onboard DAC, NaimUniti becomes the ultimate audio source hub, able to interface with digital audio sources, such as computers and gaming consoles and the latest TVs. NaimUniti has a front panel USB port for playback of music stored on USB memory sticks and suitable mp3 players. NaimUniti will take over control, and display content stored on most mp3 players connected via its front panel USB port. NaimUniti‘s CD swing drawer and transport suspension are as used on the award-winning CDX2, as is the magnetic disc clamp; a low inertia, resonance-controlling device that ensures both rigid coupling and mild damping without adding to the task of the drive servo mechanism by increasing rotational inertia. This allows the Philips’ sourced VAM1202/12 transport to deliver a performance considerably in advance of what it could if used in a conventional tray mechanism. NaimUniti is the first Naim player to utilise the new, more rigid, beam-strength mounting of the swing drawer on the front panel supported by the base. NaimUniti includes a FM/DAB tuner for those stations that have yet to move to dual- or triple-casting. Tuner presets are transparent to source. Preset one for example can be FM, DAB or Internet Radio. The optional n-Link, Naim’s custom designed iPod connector, cable allows the NaimUniti user to connect and charge their iPod through the NaimUniti‘s dedicated rear panel iPod input. Connecting an iPod to NaimUniti via the n-Link also enables iPod control and display of music content via the NaimUniti front panel. NaimUniti is a standalone product, although it can be upgraded by the addition of a separate power amp. 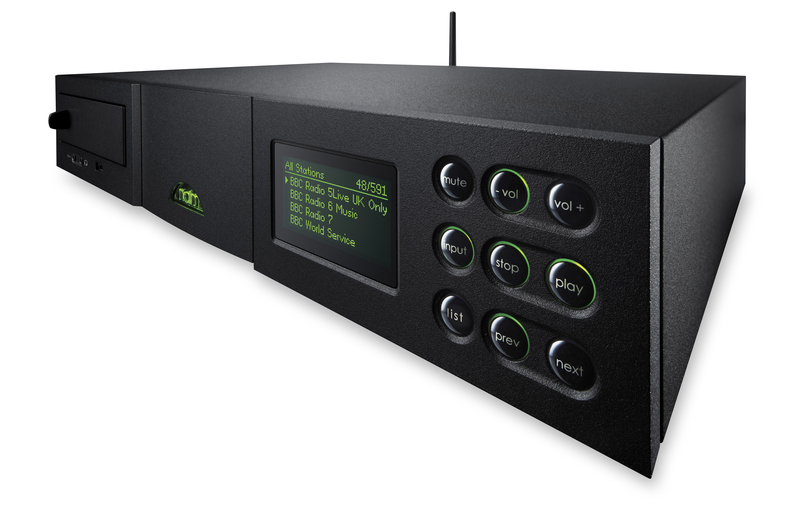 Imagine a Naim CD5i and NAIT 5i in one quality Naim chassis with Internet Radio, uPnP Music Streaming, FM, DAB, MP3 and USB stick connectivity together with iPod control connectivity and charging and you have NaimUniti in one. Windows MediaTM is a trademark of Microsoft Corporation. Location/Europe/Ireland/Celtic/LiveIreland1 – nice music, rubbish metadata! Location/Europe/United Kingdom/Classical/Classic FM – clue’s in the name! Location/Europe/United Kingdom/Electronica/1 Mix Radio Trance – clue’s in the name!